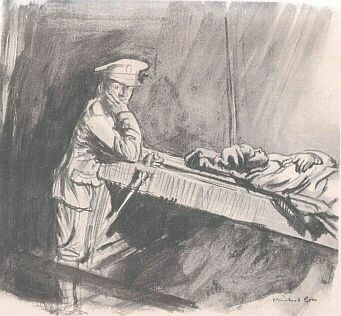 Sketched at night at a Port of embarkation of the wounded. Owing to the low tide the "stretcher cases" or "lying wounded" had all to be carried underneath the pier to the level of the hospital ship. This meant very hard work for the stretcher bearers, and one is here seen resting a moment while the previous stretcher is being carefully taken aboard to be lowered by the lift from the deck to the large wards below.